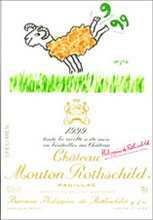 The beautiful 1999 Mouton Rothschild may be a modern day clone of their 1962 or 1985. Its saturated ruby/purple color is followed by sumptuous aromas of cedar wood, creme de cassis, wood smoke, coffee, and dried herbs. The wine is forward, lush, and full-bodied. It is already complex as well as succulent, fleshy, and long. Tannin in the finish suggests more nuances will emerge in 4-5 years. It is a complex, classic Mouton. Anticipated maturity: 2005-2030. Tasted at the 1999 horizontal at Bordeaux Index. Compared to the Lafite, this does not quite have the same level of definition and clarity with notes of blackberry, black olive, wild hedgerow and a touch of cooked meats then later with aeration: shellfish. The palate is full-bodied with firm, rounded tannins, good depth, a little more opulent than the Lafite but not quite the breeding, the tannins coarser. The finish is “tangy” nice grip, bold and assertive but a First Growth should not show the “effort” in being First. Drink now-2025. Tasted June 2009.